JERUSALEM (AP) — President Donald Trump paid a short visit to Israel’s national Holocaust memorial on Tuesday, calling the Nazi extermination of 6 million Jews “the most savage crime against God and his children” during the most sensitive stop on his two-day visit to Israel. 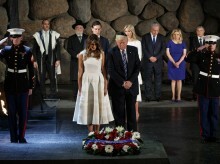 Trump had come under criticism in some quarters for planning just a brief half-hour stop at Yad Vashem, following a series of missteps by his administration on issues of concern to the Jewish American community — such as inadequately denouncing the anti-Semitic rhetoric of some of his supporters and appearing cavalier at times about the Holocaust. But Trump pleased his hosts in Israel by taking a strong stand in expressing sympathy for Holocaust victims and support for the Jewish state. In a solemn ceremony, Trump rekindled the memorial’s eternal flame and laid a wreath in honor of the 6 million Jews killed. A children’s choir sang and a cantor recited a special prayer for the dead. Nearly all foreign leaders make a pilgrimage to Yad Vashem’s vast complex in Jerusalem during official trips to Israel and most visits typically last about an hour and a half and include a tour of the museum. Previous American presidents have had lengthy, emotional visits. But Trump’s team allotted 30 minutes to Yad Vashem, citing the busy schedule of his 27-hour stay in Israel. During the ceremony Trump received a gift from Yad Vashem’s chairman, Avner Shalev: an exact replica of the original Holocaust-era personal album that belonged to Ester Goldstein, who was murdered at the age of 16. Ester’s sister Margot Herschenbaum, the sole survivor of her immediate family, sat on a chair nearby. Afterward, Trump shook the sister’s hand, and she broke down crying. In an inscription in the memorial’s guest book, he wrote, in all capital letters: “IT IS A GREAT HONOR TO BE HERE WITH ALL OF MY FRIENDS – SO AMAZING AND WILL NEVER FORGET!” Both Trump and his wife Melania signed the book. Looking on, and holding hands, were Trump’s daughter Ivanka, a convert to Judaism, and son-in-law Jared Kushner, whose grandparents were Holocaust survivors. Israeli Prime Minister Benjamin Netanyahu thanked Trump for a speech “that in so few words said so much.” He said Israel must be able “to defend itself by itself” and praised Trump’s commitment to Israel’s security. Yad Vashem played down any controversy over the length of Trump’s visit, saying official visits were “not standardized by protocol” and each was “unique and personalized” depending on the guest. While appreciating Trump finding the time to visit, Yad Vashem said it hoped his next visit would allow also for a tour of the museum. Former Israeli Chief Rabbi Yisrael Meir Lau, the chairman of the Yad Vashem Council, said he was inclined to give Trump the benefit of the doubt. Trump has come under fire for appearing to play to Jewish stereotypes during his presidential campaign and for being slow to speak out against anti-Semitism in America. His administration famously refrained from mentioning the murder of Jews in a Holocaust commemoration statement in January, and his spokesman compared Adolf Hitler favorably to Syrian President Bashar Assad last month. After Sean Spicer told reporters that Adolf Hitler “didn’t even sink to using chemical weapons” — a remark that ignored Hitler’s use of gas chambers to exterminate Jews during the Holocaust — Yad Vashem invited Spicer to visit its website to educate himself further. But recently, Trump has made an effort to change these impressions. Last month, he visited the U.S. Holocaust Museum and described how “six million Jews had been brutally slaughtered” in a proclamation marking the weeklong Days of Remembrance of Victims of the Holocaust. He also called the Nazi genocide of Jews “the darkest chapter of human history” in a speech to the World Jewish Congress. Zohar Segev, a faculty member at the Ruderman program for American Jewish studies at the University of Haifa, said he didn’t think the quick visit was meant to offend but that Trump probably just didn’t properly estimate the sensitivity. Jonathan Sarna, a professor of American Jewish History at Brandeis University, speculated that the brief visit could represent a 21st century attitude of having enough of the Holocaust. “It’s painful for the older generation to hear, but there is a sense among young people that they have Holocaust overload,” he said. Sarna said Trump’s upbringing in New York would surely have exposed him to the Holocaust and its impact on Jews. But as president he may not fully comprehend its lessons and how it continues to shape attitudes in Israel and beyond.